The potential and continuing growth of the Bio Control (Bioinsecticides, Biofungicides, Bioherbicides, Bionematicides) market has been widely reported and is projected to reach US$6.60 billion by 2022, from $3.22 billion in 2017. This increase is being driven by a combination of restrictions on traditional chemical controls, the increased adoption and understanding of Integrated Pest Management (IPM), resistance management and residue controls. Organic Production is also a growth market. In 2016, there were 57.8 million hectares of organic agricultural land, and organic products with a total value of some $90 billion were sold globally, an increase of 15% compared with the previous year. The higher price of organic inputs and the lower yields compared to chemically controlled crops, in many cases, result in a premium price being charged for organic produce. For organic products to become more widespread, this needs to be addressed. Bio Control has a synergistic and important fit with Organic Production. It offers the possibility to control diseases and increase saleable yield for organic growers in an environment of decreasing chemical control options and even fewer “traditional” products approved for organic systems. Bio Control can work, as its increasing uptake shows, along with recent high-profile acquisitions of “biological” companies by multinationals. However, in many cases, Bio Control does not offer the same levels of disease control and/or ease of use of traditional chemical controls. Many Bio Controls are more complicated to use for the grower and must be applied more carefully and work effectively in a much narrower operational window than chemical controls. This creates opportunities for adjuvants. For example, Entomopathogenic nematodes (EPNs) are generally applied to above-ground vegetation using conventional spray equipment, but EPNs will only survive for a few hours on exposed foliage because they desiccate quickly, and they are sensitive to UV rays. Therefore, an adjuvant that has humectant properties and some sticking properties would increase the survival of EPNs and, therefore, improve the control of the pests and the diseases they target. Adjuvants offer an opportunity to improve efficacy and ease of use of Bio Control, but equally, Bio Control and Organic Production create their own challenges for adjuvants. “Bio Control” covers a wide range of different technologies—from plant oils and extracts, fungi, microbes to beneficial insects—so its stands to reason that there will not be one adjuvant product for all applications. The adjuvants will need to solve the application issue and, at the same time, be compatible, both in terms of tank mixing and not harming the Bio Control agent. Ideally, the adjuvant should also have regulatory approval for organic crops; otherwise, you are unable to use it in the key organic growing market. These requirements rule out many of the currently available adjuvants. 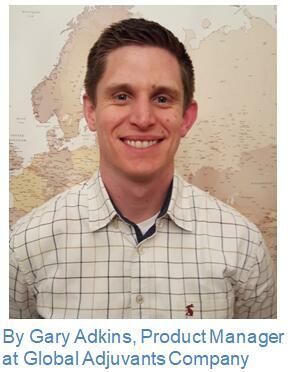 Global Adjuvants Company (GAC) is working on specific adjuvants for the Bio Control and organic markets. The first of these is Eco-Tac. Eco-Tac is an emulsifiable water formulation (EW) containing paraffin wax and comprises only components that are food safe. It is used as a sticker in combination with both conventional chemicals, and with Bio Control fungicides, miticides and insecticides in Integrated Pest Management (IPM). Crucially, it has full organic approval, with both Ecocert in Europe and NOP for North America. GAC is currently conducting extensive testing with various industry partners to ensure compatibility across a full range of Bio Control agents, including living EPNs and bacteria. Eco-Tac contains paraffin wax that is similar to the composition of the leaf’s own waxy cuticle; this gives it perfect affinity with the leaf and no phytotoxicity. It does not damage the leaf cuticle, unlike paraffinic oils. It acts as a sticker with excellent persistence on the leaf; this keeps the active in contact with the target for longer, reduces off target application, improves rainfastness and limits evapotranspiration of the product off the leaf. Eco-Tac will also provide water conditioning benefits and anti-foam action, both of which are usually difficult to achieve when restricted to organic approved adjuvants. Bio Control offers exciting possibilities for improving the efficiency of all crop production, especially Organic Production, but it will need specific adjuvant solutions to overcome efficacy and use issues. The adjuvants currently available will work in some cases, but much more work is needed to ensure compatibility. Just as a wide range of chemical adjuvants is now available for chemical controls, in the future, I believe we will see a new range of bio adjuvants. 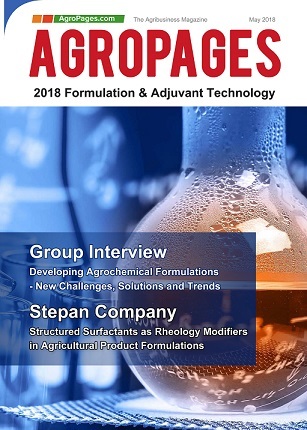 Please download AgroPages' latest business magazine - 2018 Formulation&Adjuvant Technology to see more.